Although today is the quintessential end of summer, I can’t really recall it having felt like that to me. Growing up, I was usually in school before Labor Day and this was really the end of summer. It may have been a chance to have a picnic or cook out in the backyard – kind of a last hurrah before the fall was to begin in earnest. How will you spend Labor Day 2011? “Labor Day is a United States federal holiday observed on the first Monday in September (September 6 in 2010). Who knew? Not me, that’s for sure. 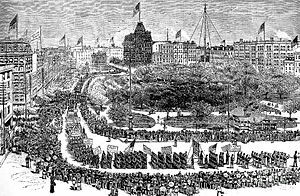 In any case, I hope you have a wonderful day of labor, rest or a parade (See picture of the first Labor Day parade).